Keep watch of your home or your commercial property 24/7 with the help of security cameras installed by Morrill Electric. An estimated 75% of all crime is property crime — whether this is trespassing, loitering, property damage or breaking and entering. 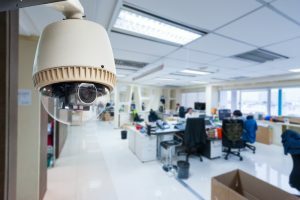 Luckily the chances of your property becoming a portion of that 75% are drastically reduced after installing security cameras in strategic places. Our goal is to improve productivity and safety with the help of state-of-the-art residential or commercial video camera systems. Where the building or home entrances are located. We always recommend a camera at every entrance. Where the nearest power source is located so that the wiring can be properly installed. Whether or not there are any obstructions on the property such as trees, bushes, or building features that need to be altered and/or removed. Not all types of security cameras can be installed in the same place. Depending on size or model, Morrill Electric may need to propose a few alternate placements. Why Install A Video Surveillance System? Protect your home or business with a new video surveillance camera system! Morrill Electric is here to install brand new systems, update existing systems, as well as test security systems. Give us a call at (978) 388-1522 or request a quote online.